All Knauf Insulation mineral wool products benefit from a revolutionary, bio-based, formaldehyde-free binder technology, based on rapidly renewable materials, instead of petro-based chemicals. It reduces embodied energy and delivers superior environmental sustainability. Such technology enhances the environmental credentials without affecting the thermal, fire or acoustic performance. All products with ECOSE®Technology are completely natural and free from any dyes. Earthwool® Acoustic Roll represents no known threat to the environment and has zero Ozone Depletion Potential and zero Global Warming Potential. Earthwool® Acoustic Roll has excellent sound absorption properties. These coupled with a Euroclass A1 to BS EN 13501-1 fire rating ensure that good performance levels are reached without breaking the bank where acoustic reducing properties are required..
Earthwool® Acoustic Roll is designed for friction fitting between resilient timber battens and timber studs in Robust Detail separating floors and walls. Earthwool® Acoustic Roll provides a high level of sound absorption, whilst also improving the thermal and fire performance of the wall, floor or partition. Using glass mineral wool as a sound absorbent layer in partitions and floors significantly improves their acoustic performance, whilst only adding minimally to the overall mass of the structure. In partitions glass mineral wool complements the plasterboard linings by absorbing airborne sound in the cavity and reducing reverberation, it is particularly effective at preventing the hollow sound that can occur in partitions with unfilled cavities. 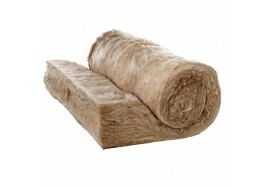 Knauf Earthwool Acoustic Roll is a flexible glass mineral wool quilt which is lightweight, flexible,..